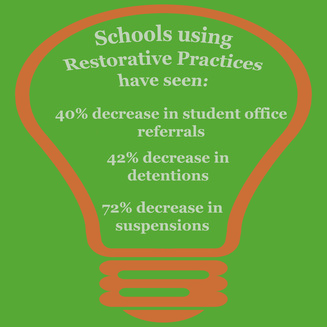 Restorative justice in schools is a front line for preventing lives of crime. Rather than detention, suspension and expulsion — all of which thwart learning — restorative justice builds on the power of relationships, creating a cultural shift in how schools respond to misbehavior and wrong-doing. Students are provided a supportive means to take accountability for their actions, to hear from victims they’ve harmed, and to take steps to repair the damage they’ve caused. 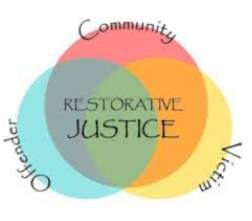 RJP offers ongoing restorative intervention through school trainings in restorative justice, victim offender mediation and restorative conferencing. Judges, prosecutors, and probation officers can divert youth and young adults who have committed a crime from the traditional path of criminal justice – conviction, criminal record and in some cases incarceration – to Community Resolution Conferencing. In these circles, victims talk about the damage that was caused and the impact on their lives. The offenders tell what happened and take accountability for the harm they caused. With the help of community participants, they reach consensus on how offenders can repair the harm they have caused. When the offenders complete these agreements, usually with the help of an RJP volunteer mentor, the court typically reduces or dismisses the charges. In partnership with the Maine Coastal Regional Reentry Center, the Waldo County Sheriff’s Office and Volunteers of America, RJP applies the principles and practices of restorative justice to build trust and relationships among men and staff in the Center and in the community of Belfast and surrounding area. 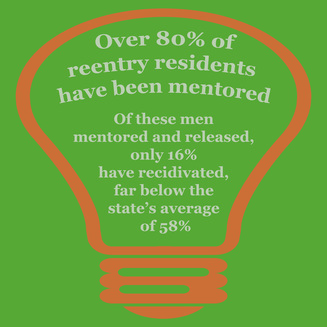 At any given time, up to 32 resident men complete a rigorous application and selection process to finish the final eight to twelve months of their sentences at the Center. We match these residents with mentors from the community, teach them restorative justice and facilitate circles to address issues and resolve conflict.